A little girl with a brilliant smile, Pooja endured a horrific early life in her home of Hyderabad, India. She lost her birth parents as a toddler and joined one of the country’s orphanages where maltreatment and cruelty is widespread, especially toward girls. Adopted at 12 by Candy, Pooja arrived in the United States and began a long, arduous journey of healing deep wounds. “She’s endured unspeakable brutality, but she’s never, ever let it break her spirit,” says Candy. Jesse has a dark history as well. When rescued, the beautiful bay Quarter Horse was missing 150 pounds, half her tongue and any trust in humans at all. 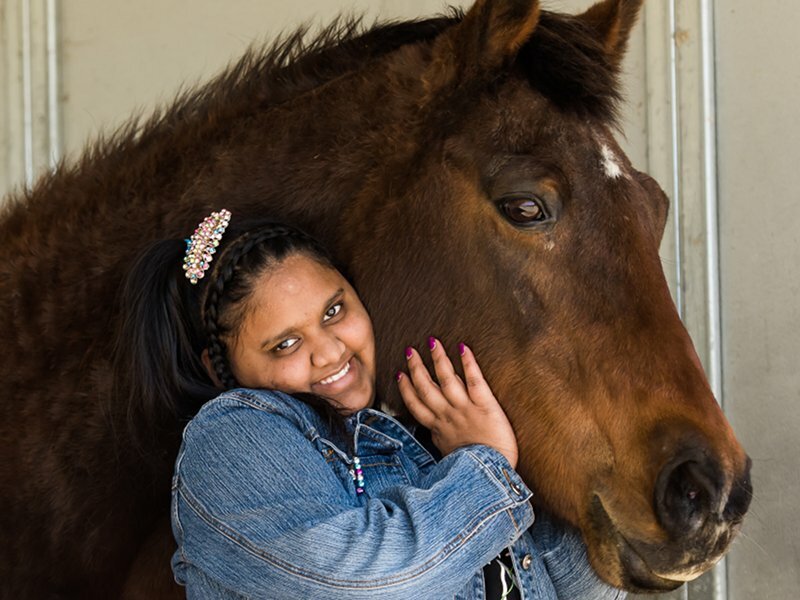 But Jesse’s story of restoration has become a inspiration to the kids served at Hope Reins, especially Pooja.